Skyscrapers are going up, but are they getting sold? EconomyBeat.org reports on the Skyscraper Index, a calculation that finds big buildings go up during financial crises to prove a country’s strength, but often they foretell economic disaster instead. V, Double dip (W) or L recession? Things look bad for the EURO if the skyscraper index is right. We have heard recently about problems in the Eurozone. Is the worst over or is the worst still to come? The skyscraper index indicates: Trouble ahead. 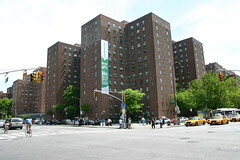 Trouble is no stranger to the Stuyvesant Town/Peter Cooper Village residential complex in Lower Manhattan. The biggest real estate deal in New York City history went bust this week as two major developers backed out of a plan to buy the area. WNYC reported that tenants are nervous about the instability the fallout will bring. This entry was posted in Econstory, PRX: Public Radio Archive, WNYC and tagged economybeat, eurozone, housing, index, new york, real estate, recession, skyscraper on January 26, 2010 by Laura Hertzfeld.